Set of four used ball-lock kegs and four complete o-ring rebuild kits plus free shipping. Each rebuild kit includes 5 o-rings - one for the lid, 2 for the body connects, and 2 for the dip tubes. 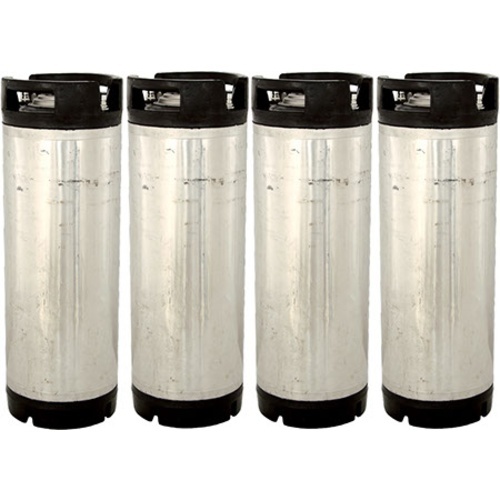 These ball lock keg 4 packs ship free, which means a great value for you! 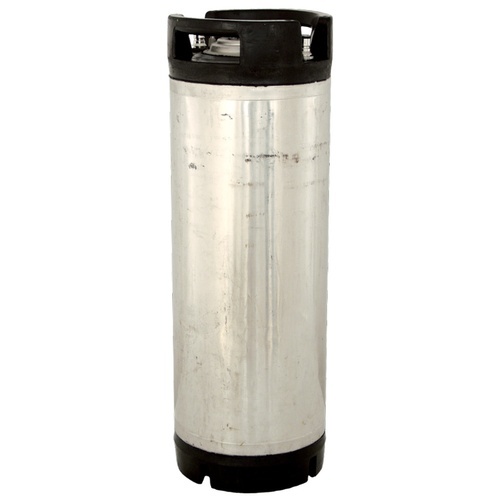 A great price on unrebuilt ball lock kegs. To totally rebuild the keg you should also consider a new relief valve and poppets (part number listed below). To clean the inside Alkaline Brewery Wash works great for eating away residue. We recommend taking these steps yourself before and after each use. The body connnects on a keg are the metal posts where the quick disconnects attach too. They should be removed for cleaning and sanitizing before each use. Ball lock kegs can come with either 11/16" body connects or 7/8" body connects. We sell deep sockets for the removal of either one. So if you do not have these sockets at home and want to make sure you can disassemble the kegs you may want to purchase both sockets below. Then you will always be covered as your keg collection grows. This is my second set. They come in super great condition for the price. The outsides of the keg aren't pretty, but it's only superficial. increasing production means I need more kegs! Friend recommendation, good price, need kegs to build out keezer. Second time ordering this deal speaks for itself! Cheers MoreBeer! This was a great deal and I am expanding my kegeeator. The reviews were good and the price was good. 4 is better than 1! Great price from a quality company. good experience with kegs at Morebeer!!! Of the 10 kegs I have these four are in the best condition. The next time I increase batch size and need more kegs I will be ordering here. The kegs showed up as Advertised. All are complete and in good condition. Just what I ordered. I will buy this again. The price of these is good, but all four of the kegs that arrived were really dirty and dented. All four of them needed substantial repair to either the base or top rubber (or both) since they were so banged up that they were falling off from the keg. Be ready to replace all of the gaskets including the release valve, none of mine would hold pressure as they arrived. All came pressurized and still holding seal. Had some minor dents and messy outside but nothing that effects the performance. After a rebuild and cleaning they were good to go. It's nice that they throw in the rebuild kits. I just hope the poppet seals hold up. May want to consider having a couple of those on hand. Products calms in good shape, and gaskets we’re still useable. Would buy again ! The used corny kegs are a great way to keg up my beer batches. I highly recommend new O rings and going over them before use. A bit dinged up, but function perfectly. I bought this 4-pack recently to run 3 homebrews through a Jockey Box for a wedding... The kegs performed flawlessly - the best part was they were already cleaned and sanitized when they arrived. Just showed up today. Lets just say these are a little rough. Actually, really rough!! 3 are good enough but the 4th should never have been shipped. Dented and won't pressurize. I'm going to do my best to fix the 4th, but I have serious doubts that it will work. So I actually got 3 for $179 which I can get at my local HBS. An just so you know, I've bought this type of used keg before. I just bought these, haven't used them yet, but they arrived with pressure in them, so seem intact. They are a bit grubby looking, as you might expect with used equipment, but they should be mostly out of sight. Only complaint is that they just went on sale for $40 off right after mine arrived! First batch of beer just went into secondary so will be trying one out soon. Great kegs. I would have paid twice as much for the exact same quality kegs at my local Homebrew store. One tank was heavily dented but still held pressure. Overall they are a good value. Would purchase more. Very clean. All were still holding pressure when received. these were in great condition for being used. if i ever need kegs in the future, i will buy them here! thanks. I’ve ordered 2 sets so far and all 8 kegs have worked great! Nice kegs. Got here a day early and still had pressure. No stickers to clean off! Received these in very good condition. All four arrived pressurized, no labels stuck to them and they were clean for the most part. Good deal considering the O-ring kits included and free shipping. I wouldn't hesitate to purchase these again. New Chinese kegs from another vendor have gone up in price and their shipping is ridiculous! This is the better deal! Any time you buy these corny kegs it can be a bit of a crapshoot. This time I was very satisfied. Yes, they are not cleaned or rinsed out, and I had to use a rubber mallet to break the seal and remove the lid, but after a bit of elbow grease they came out looking pretty dang good considering. This is the second time I bought the 4 pack and this set was what I was hoping for. More than I expected git new seals with with kegs. Got what I ordered. 'Nuff said. My kegs came complete with soda residue, as expected. One of the kegs was free of stickers (gasp), the others all had a large 4x5" label mid-keg AND a 3" wide sticker that encircled the entire keg. Neat trick though--my wife's hair dryer made label removal MUCH easier. Too bad that little bit of inspiration didn't hit until AFTER I had scraped/soaked/cried over the first of the accursed three labeled kegs. A little polishing with Barkeeper's Friend and the kegs shine like new. All four kegs arrived pressurized. I changed the O-rings using the included sets anyway--don't care for Pepsi-flavored beer. One of the kegs had a dent. All posts were 7/8". All rubber handles and feet were tightly attached. With a promotional $25 discount plus free shipping making this deal come in at $44 per keg, I couldn't resist buying this set. Would I buy this again? Most definitely, especially at this price point. Received 4 ball lock kegs, all have held pressure and only had to change o-rings on one of the kegs. 2 kegs came with 11/16" socket posts and the other 2 came with 7/8". One was complete with soda residue, the other 3 were clean with some sort of cleaner/sanitizer inside. They were received a day earlier than originally scheduled which is always a good thing. Already filled one with an IPA and another is scheduled to be filled with a light centennial lawnmower brew this weekend! I had to leave a review so you're not swayed by the negative feedback. All 4 kegs I received were in excellent condition and will work perfectly. One will need a replacement relief valve, but otherwise I am very pleased with this order. They all had a single 2 inch wide sticker going 75% of the way around the keg, otherwise clean. No major dents. Thanks MoreBeer! I had a similar experience to TravisN. 3 of the kegs were in near perfect condition, but one was absolutely terrible. The base was poorly taped on and it fell off when I pulled the keg out of the box. This keg also came with the dome style pressure relief, so I am going to have to go somewhere else to replace that and one of the posts is badly damaged. This keg is unusable out of the box and with all the money I am going to have to put into it to make it work, i could have just about bought a new keg. Happy with three of the kegs, but the fourth arrived with a broken post, badly bent and maimed "neck", and a cracked dome style pressure relief valve. Morebeer doesn't carry the Firestone posts or the dome style pressure relief valve. I was sent a Cornelius threaded post that won't fit. Customer service response basically they are used so that's it. I can pay to return or live with it. A quick glance before shipping would have prevented this. Love this deal! Bought one set, arrived less than 24 hours later. What was described in the item description was exactly what I got. Kegs with stickers, dents, soda residue. Can't complain! Came with four sets of new o-rings, like described. I was so happy with this I just put in an order for another set. I mean come on, you could go on Craigslist and get them for $50, have to drive to pick them up, inspect them, and buy replacement o-rings. Or buy them for $50 each here, ship to your door free, new o-rings, and you can return them if you don't like them. Hard to argue with a deal like that. Whoever MoreBeer got these from, they certainly abused them. I didn't have as many problems as JoeD (I was only missing a single keg lid foot), but a few poppets don't seal and one of the pressure relief valves was cross-threaded. If you can provide the TLC, they are a great deal, just be sure to stock up on spare parts. I've bought used kegs from different vendors and these are by far the worst I've ever bought. They had deformed loose handles, wide stickers all the way around and two of them didn't have pull rings on the pressure relief valves. Yes I read the description of the product before I purchased and realize they are used. I just didn't realize they would be incomplete. Other vendors have similar descriptions of their used kegs and they were all much better than these. I emailed customer service and didn't even receive a reply. I called customer service and the lady said I could buy the replacement parts I needed (pressure relief valves) on their site. She said they may even come without lids because they are kegs that need rebuilt. Thanks lady. I would not recommend these to anybody. As it turns out the fine folks at MoreBeer chose again to stand behind their product and made the order complete. This is the level of customer support I've grown to expect from MoreBeer and consider this transaction more the exception than the rule. Thanks Katy!